The Civil War, the Emmy Award-winning nine-part series from Ken Burns, is now fully restored to high definition, achieving the optimal picture quality originally intended. This six-disc collector's set also features over two hours of new bonus video. 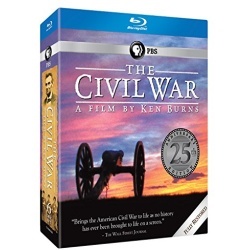 Hailed as a film masterpiece and landmark in historical storytelling, Ken Burn's epic documentary brings to life America's most destructive - and defining - conflict. With digitally enhanced images and 5.1 surround sound, here is the sage of celebrated generals and ordinary soldiers, a heroic and transcendent president and a country that had to divide itself in two in order to become one.